Puck drop is 10 minutes away, and there seems to be something different about our Warriors this morning. Maybe it’s the early game time (well, early for any high schooler anyway, looking to sleep in on a Saturday morning), but this groups appears to be the most relaxed I’ve seen them all week. Starting lineups are announced, the National Anthem is played, and we are ready to play hockey. Strate, Labitus, and Weinstock square up on the red line, Sorsby & Holman back them up on the blue line, and Gavin William tends to the net. Puck drops, and we are playing hockey. As the game gets underway, the relaxed pre-game feeling appears to carry over to the ice. Boulder accumulates 8 shots and 1 goal in less than 7 minutes, and has Steinbrenner’s back against the ropes. Steinbrenner does their best to fight back early, unfortunately they are not able to stay out of the box, resulting in 3 Boulder powerplay goals, and 1 more even strength goal, and there is still 2 minutes left in the first period, the score is 5-0 Boulder. Steinbrenner needs to push, but can’t seem to find the energy. As the first period comes to a close, Steinbrenner is down on both ends on the scoreboard; 5-0 the score, 21-2 the shots. As the Warriors bring it in between periods, it is clear they are missing that spark that carried them all the way to Nationals. You can see it in the way they are carrying themselves to the bench. Their demeanor and body language has changed. Their heads are down, their strides are slow. This team needs to remember their identity, and who they are. They are the 2019 Lightning High School Hockey League Champions. They are the 2019 SAHOF State Champions. They’ve earned the right to be here. This group has the talent and skill to skate with any team. But for some reason, they’ve lost their confidence. There is an entire bleacher section full of friends and family here to support them. The friends and family believe in them. The boys need to keep believing in themselves, and remember everything they’ve accomplished as a group. As the 2nd period is about to start, Coach Bubley makes a change in goal, putting in Jackson Barton to replace Gavin William. The change in net may have generated some boost. At 15:32, with Steinbrenner shorthanded, Patrick Labutis fights free for a breakway and the Steinbrenner crowd starts to stir with excitement. He gets hauled down at the hash marks, and certainly a penalty shot will be awarded, brining the fans to their feet. That excitement would turn to disbelief as instead, a 2-minute minor would be assessed to Boulder. Unfortunately, it doesn’t result in a powerplay of any great length for the Warriors. At 12:31 in the second period, our boys would be awarded their first true powerplay. At 6:43 they would be awarded their second. The Warriors are finally getting some sustained pressure in the Boulder end of the ice and are getting some good opportunities. Giving our boys time to move the puck and get setup generally does not work out in favor of many opponents. Boulder is no exception. With 0:29 left on the clock, after 30 seconds of sustained zone time and puck battles in the offensive zone, Justin Strate would blow one by the Boulder goaltender (assist to Weinstock) for the first Warriors goal of the day! The second period would end, 7-1 Boulder, with shots 31-14. With the boys heading to the dressing room for the second intermission, you can’t help but wonder what words of wisdom will be shared to try and get this group refocused. Sure, the chances of coming back from 6 goals down heading in to the third period are unlikely, improbable even. But not impossible. I was once part of a team that was up 8-0 heading in to the final period. We pulled off the throttle, and guess what, that other team came right back, and pumped 8 goals of their own in that period. Did I accidentally put one of those in my own net? Yes (not one of my shining moments). Moral of the story, you have to keep pushing. The other team thinks they own you right now. You’ve got ‘em right where you want ‘em. Lull them in to a false sense of security, and strike early and often before they know what hit ‘em. Intermission over. Here come the Warriors for their final period of the 18-19 season. 13:27 on the clock. Steinbrenner gets their first offensive push of the period. Prassanna sends it to Barton who dishes over to Weinstock, guess what happens next….. that sucker is rifled in! 7-2! This was Steinbrenner’s first shot of the period, and it’s a big one! We need to build on this momentum! Boulder would make sure our Warriors couldn’t keep their foot on the gas. They’ve tacked on 12 shots this period to Steinbrenner’s 3, with 2:00 left on the game clock. A late penalty to Boulder puts the yellow sweaters on the powerplay 1 last time. As the final minute ticks down, you can hear head coach Dan Bubley yelling from the bench, coaching his group to the very last second. A testament to the dedication and passion he has for the game, and these young men. The clock hits zero, the buzzer sounds, and the final handshakes are given at center ice. Just like that, the 2018-2019 Steinbrenner season is over. It might be a little cliché, but I mean this with all sincerity, you have to be proud of what the Warriors accomplished this season. Yes they went 0-3 at the National tournament. Yes their season is over. Regardless of that, they made it here. 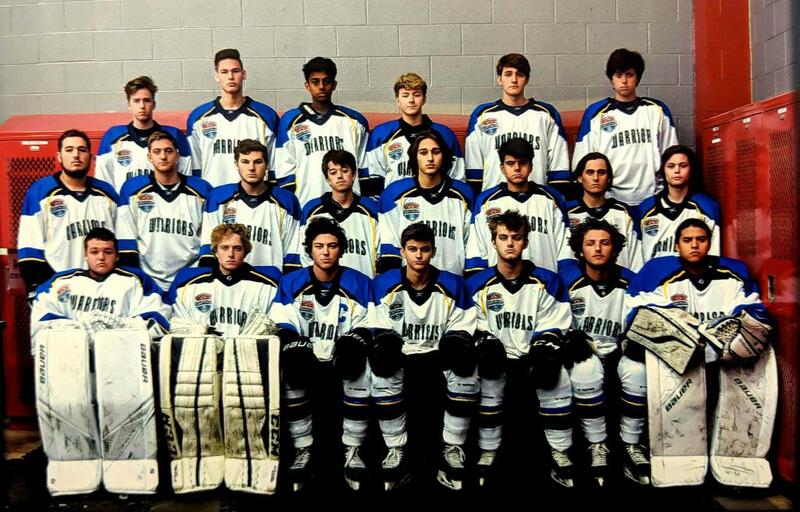 They battled all year long, and earned the right to represent the State of Florida, the Tampa Bay area, themselves, their team, their parents, their community, and the Lightning High School Hockey League. It’s not easy to get here. Hundreds and hundreds of high school teams start the season with hopes of having an opportunity to play for a National Championship. Very few teams will actually get the chance. It is so difficult to get here, you have to enjoy every moment, and take it all in, no matter if you win or lose. Who knows if you will ever have another chance to make it this far again. Is it disappointing to lose? Yes. Would it have been nice to win at least 1 game? Absolutely! But you know what? Not winning a National Championship doesn’t mean the Warriors are not champions. They are champions. They are OUR champions! And as those infamous yellow jerseys came off the ice one last time today, a standing ovation from the friends and family in attendance. They probably don’t realize it now, they probably won’t realize it until many many years from now, but these guys, these Warriors, just had the chance to do something very special. They had the love and support of not just their friends and family, but the entire Lightning High School Hockey League family. Congratulations to the 2018-2019 Steinbrenner Warriors! It’s been one heck of a ride!